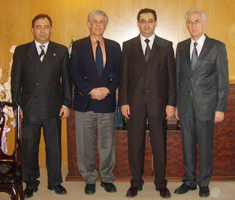 Dr. Savaş Alpay, Director General of SESRIC, received a delegation from the World Health Organisation (WHO) in his Office on Wednesday 18 February 2009. The delegation comprised of Dr. Armando Peruga, Coordinator of the Tobacco Free Initiative of the WHO, Dr. Toker Ergüder, National Tobacco Control Programme Officer (Bloomberg Initiative) of the WHO Regional Office in Ankara, and Dr. Nazmi Bilir, Head of Department of Public Health at Hacettepe University, Turkey. At the outset, the Director General of SESRIC, Dr. Savaş Alpay expressed his thanks and welcome to the delegates and briefed them on the activities of the Centre in the three areas of mandate: research, statistics and training. In particular, he highlighted the research and statistics activities of SESRIC in health - related areas in general and tobacco control in particular. In this context, the Director General briefed the delegation on the report prepared by the Centre on “Tobacco Control in OIC Member Countries”, which has been submitted and presented at the 1st Islamic Conference of Ministers of Health held in Kuala Lumpur, Malaysia, in June 2007. In the light of the results of the said report, the Conference adopted, said the Director General, a Resolution on Tobacco Control in the OIC Member States and requested the Centre to continue following up this issue in the member states. Dr. Alpay also informed the delegation that the Centre has actively participated in the 3rd Session of the Conference of the Parties (COP) to the WHO Framework Convention on Tobacco Control (WHO-FCTC), which was held in Durban, Republic of South Africa, in November 2008. The Centre participated in the Conference representing the Organisation of the Islamic Conference (OIC), as an observer to the WHO-FCTC. During the Conference, SESRIC exchanged views with the delegates of the OIC Member States as well as the representatives of the WHO, COP Secretariat and NGOs, on further enhancing and strengthening the Tobacco Control activities and the implementation of the WHO-FCTC in the OIC Member States. The Director General also mentioned that, in its capacity as a member of the Interim Steering Committee of the Islamic Conference of the Ministers of Health, the Centre has recently actively participated in the 1st Meeting of the said Committee, which was held in Kuala Lumpur in January 2009. The Centre shared the discussion and exchanged its views with the representatives of the other members of the Committee on the preparation for the 2nd Islamic Conference of Ministers of Health, which will be held in Tehran in the first week of March 2009. On the other hand, Dr. Alpay informed the delegation that, in its efforts for developing a special database on the main indicators on health and health-related fields, the Centre has already identified and collected the relevant data on the OIC member states on a set of 37 indicators now available at the Centre’s main database “BASEIND”. On his part, the Head of the WHO delegation Dr. Armando Peruga, Coordinator of the Tobacco Free Initiative (FTI) of the WHO, expressed his thanks for the Director General of the Centre for his warm receiving of the delegation and informed him that the WHO is ready to cooperate with the Centre in the field of health and tobacco control through exchanging technical expertise in research and statistics as well as in technical training for the benefit of the OIC member states. During the discussion, the two parties elaborated on areas of possible cooperation between SESRIC and WHO. These included the possibility of organizing joint training, workshops and programs on issues related to tobacco control in OIC member states such as legislations on tobacco control, public awareness, tobacco advertising, promotion and sponsorship, e-health application in OIC member states, etc., providing the center with experts to participate in the training workshop organized by the Center on health - related issues, and the possibility of regularly providing the Center with the publications of the WHO and free access to the statistical database (global database) of the WHO.